Choosing window treatments for a room can be an agonizing process. With so many choices and styles available, its easy to become overwhelmed and confused about what would look best. The color of the room plays a large part in deciding which window treatment will accent the room without overpowering it or looking out of place. In a beige room with red accents there are a lot of options available for window dressings that will not only accentuate the beauty of the room, but that will add personality and zest to an otherwise plain space. Patterned curtains are the easiest way to add personality to a room with this theme. White curtains with red cherries and brown or tan stems adds immediate charm to a room and lightens the walls with its bright white background. Fun and whimsical, cherries tie in perfectly with the red accents and enliven the space with their freshness and appeal. Another fun pattern that would work well in a beige room with red accents is a cowboy theme. Typically done on tan backgrounds, scenes of cowboys riding bucking broncos and roping cattle would be ideal for a young boys room or in a home in the southwest. Try new and unusual patterns that tie the beige walls and red accents together. If the perfect curtain pattern cannot be found, try making curtains from material found at the fabric store. Many home decor stores offer curtains in a variety of striped patterns. 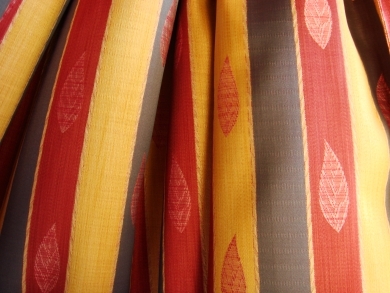 Curtains that contain red and beige stripes would accent a beige and red accented room perfectly. Vertical striped curtains elongate the window, so if the window is small the stripes will help it appear larger and more significant in the room. It does not matter how wide or prevalent the stripes are in the curtain, as long as the two colors are included in the pattern, the curtain will work well in the room. In this room, the obvious color choices for solid colored curtains are beige and red. Red curtains would be the better choice for drawing the eye and making the red accents pop. Beige would tone down the red accents and blend in better with the walls for a more seamless look in the room. Both solid color choices would work well, but both would have an entirely different effect on the visual impact of the room. Curtains with small accents of red would add another color to the beige and red space. For instance, if the curtains were black and had a piping of red, the black would then be added as an additional coordinating color. This is a good option to try if the normal red and beige were wearing thin and the room needed a quick redecorating. A white curtain trimmed with beige embroidered flowers would also work well in the space. Experiment with the different looks and feels that curtains can bring to the room to find the one that works best for the space. Consider all options, and if possible, purchase two different looks that can give the room variety. Make the curtains work for the room and accent what is already there, instead of trying to make the room fit to the look and feel of the curtain. This article was written by Alyssa Davis of Metal-Wall-Art.com who specializes in creating stylish interiors with metal wall art and black metal wall sculptures.